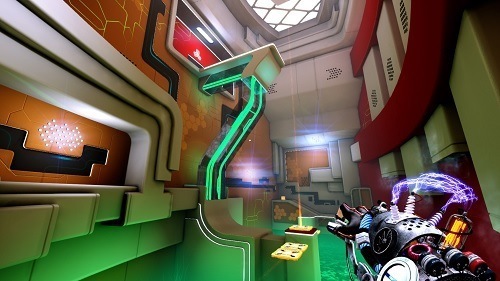 Magrunner: Dark Pulse is a puzzle game with many similarities to the popular Portal series. The game was released in 2013 for Windows and made its way to consoles later that year. The plot in Magrunner: Dark Pulse is a bit all over the place and you’ll have to stop and pause to get your head around the game. This isn’t necessarily a bad thing and is more to do with the insanity of the storyline rather than poor story telling. Players control Dax Ward through their adventure who lost his parents when he was younger and ended up being raised by the six armed mutant known as Gamaji. The story revolves around Dax after he enters a contest for the opportunity to go into space along with several other contestants. This contest though is revealed to be a plot by a billionaire to achieve his own dark agenda. 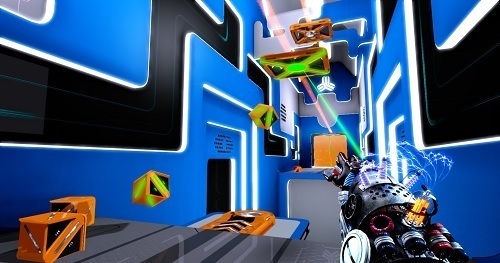 Gameplay involves using the Magtech glove which uses a very simple mechanic but one that will take you the entire game to master. This glove is able to change the colour of objects around you between blue and red. Items of a similar colour will attract each other while opposite colours will repel (much like magnets). Like most puzzle games this ability slowly evolves throughout the game as you are introduced into more difficult puzzles, towards the end players even can enlist the help of a trusty robot dog that gives off his own colour. You can expect your adventure in Magrunner: Dark Pulse to last around 10 hours and has 40 levels in total including the final ending. While you’ll likely breeze through the first portions of the game the difficulty reaches nose bleed level pretty quickly once enemies and other strange elements are introduced. A puzzle game with many similarities to the popular Portal series. Chance the colour of objects to attract/repel each other. Great pacing that slowly adds new mechanics. Not a puzzle game for the casual player.